What made this year’s Mid-Autumn Festival special to me was that my homemade traditional mooncakes were loved by many of my friends. All major ingredients I used were homemade, from the salted eggs, and lotus seed paste to this golden syrup. Sharing those mini golden mooncakes (recipe coming soon), loaded with natural sugar fragrance with my friends was really a joy. 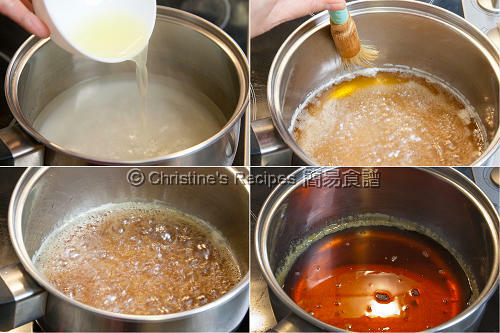 Golden syrup, also known as invert syrup, is commonly used in making different desserts that brings in a good flavour. For those who are allergic to honey can use golden syrup instead. Back to mooncake making, what makes the pastry of traditional mooncakes unique is the magic made by this golden, high-quality syrup, so that’s why the traditional mooncakes smell so fragrant. To cook golden syrup is a bit tricky, two important factors has to be kept in mind: timing and temperature. Otherwise, it’d either be burnt, or too runny, if it’s cooked too long or too short, or cooked on too high heat. Use a stainless pot, add sugar and water. Lightly swirl the pot to combine the sugar and water. Turn on the heat to medium and bring it to a boil. Add lemon juice. When it boils again, reduce heat to low. Don’t ever stir or touch the sugar solution. Continue to cook up to 110 - 115C (230 - 240F), for about 45 minutes. 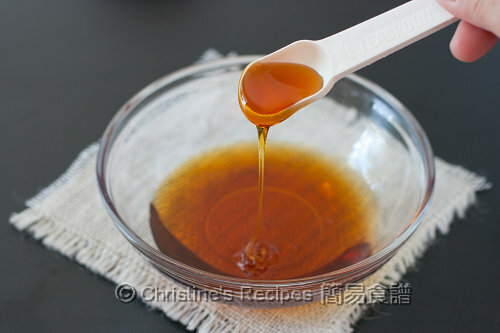 Along the way of cooking syrup, damp a brush with water and brush away the sugar on the sides of the pot and avoid the sugar from being crystallized (as shown in picture). When the syrup becomes amber, with a consistency close to honey but not yet. Remove from the heat. Let it cool and transfer to a clean air-tight jar. It’s ready for use after one or two days. 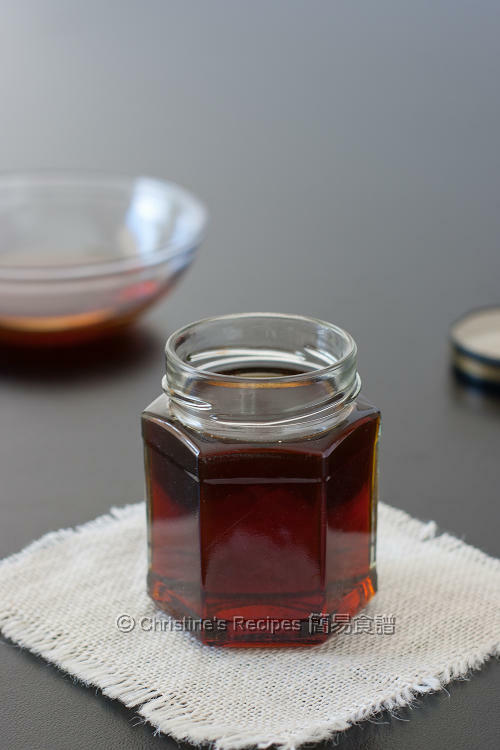 The golden syrup can be stored up for several months to a year at room temperature. The longer the syrup matures, the more fragrance and favour it would bring up. If you’re trying the first time, don’t leave the cooking sugar mixture unattended. The temperature of cooking syrup is crucial as the heat affects the consistency of sugar once it cools down. We are looking for sugar to be cooked up to 110-115C, suitable for making mooncake pastry. It’s better to have a candy thermometer. If you don’t have one, you might use eying the consistency instead. When the syrup turns golden brown, spoon out a bit of syrup and make sure it’s cooled down. Place a drop between your thumb and index finger. A thin thread can be formed when separate your fingers. Or just simply cook to the consistency a bit thinner, or runny than honey. When the syrup is still hot, it looks rather watery and runny. Once it cools down, it becomes thicker. Use stainless steel pot to make syrup. Don’t ever use utensils that are made of iron or aluminum. The longer you cook the syrup, the darker it becomes. Thus, make sure the stove heat is not too high, otherwise you’d lose all the water before getting the amber colour you want. If the syrup turns too hard after cooling down, don’t panic. It’s because the syrup is cooked too long and lose too much water. Just add some more water, then cook again, to your preferred consistency. Or vise versa, if the syrup is too runny, you can also heat it up and cook again. oh wow i never knew you could make your own golden syrup! the process is very similar to making caramel, no? Great tips and thanks for the recipe:D been looking for one. Thanks so much for sharing this recipe. Will certainly make my own when I make mooncakes the next season. This will definitely help me in my search for a better homemade syrup not only for mooncake but also for pancakes. It's magnificently golden brown. How brilliant, I did not know you could make homemade syrup, thanks for sharing. Photos are fantastic,have to try the syrup soon. Thanks for sharing the "secret". I did not know about the syrup in the traditional mooncake pastry. Oh.. I never know ho to make golden syrup. Thanks for sharing the recipe and tips. I never thought making a golden syrup would be this easy. The consistency sure looks like honey. Using this instead of regular sugar for desserts and other concoction will really make a difference. Thanks so much for this very, very helpful post!